WE INVITE YOU TO SIP, SAVOR AND SWIRL … ALL YEAR LONG! Become a member of hope & grace's Premier Cru wine club, the reserve wine club of hope & grace wines. 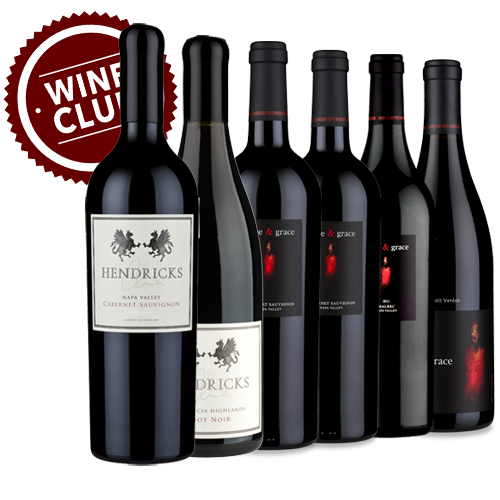 Club members will receive two shipments per year of wine, each highlighting current release, highly allocated, library releases, and Hendricks Wine reserve selections not available to other clubs. Your average charge will be approximately $500 to $900 + tax if applicable per shipment, which will include 6 or 12 bottles per shipment. Please let us know if you would like to receive 6 bottles or 12 bottles per shipment. This is a wonderful gift for the wine lover in your life! Each of our wines are hand crafted by Artisan winemaker Charles Hendricks. We take great pride in our wines and know that you will enjoy being a member of our wine club. If you would like personal service and would like more information on our wine club, please call 707-944-2500. Legal Policy: There is no charge to join the wine club and you may cancel your membership at any time after 1 year (or 2 shipments). Cancellation must be done at least 30 days or more prior to the next wine club shipment and must be in writing. You must be at least 21 years old to receive shipments and wine must be delivered to an address where someone over 21 is present to sign for the wine. Wine club packages will be charged to your credit card prior to each shipment. Wine club packages are non-refundable once they have been charged to your credit card.